I am so happy Spring is finally here! Hopefully, we will start to see warmer days here in New Jersey. 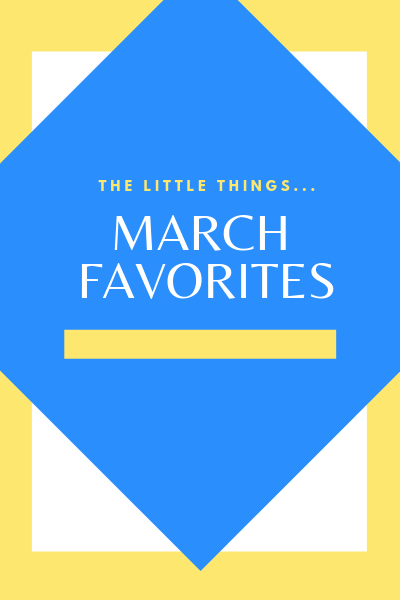 Today, I’m bringing some of my favorite little things from the month of March. Tetley Green Tea Decaffeinated – Several years ago, I tried green tea, but I just didn’t care for the taste. My husband picked these up accidentally, so I decided to give it a try. I’ve been making my own fresh Iced tea using four of these bags with a little bit of stevia and I’m really enjoying it. There is no bitter taste and it’s been my drink of preference every day. SkinnyPop Popcorn, Skinny Pack, Original, 0.65 Oz per pack, Pack of 6 – In an effort to snack healthier, I thought I would give this a try. It comes in a variety of flavors and it’s a great snack to have after lunch or dinner. I’m looking forward to trying more flavors soon. NEINEIWU Women’s Loose Casual Short Sleeve Chiffon Top T-Shirt Blouse – Amazon came through for me again when I needed a new top in a hurry. I wore this to my sister’s surprise birthday party last month and it’s the one I’ve been reaching for this month too. I love that it’s very feminine, love the red color and most importantly, it’s comfortable to wear. It comes in several colors and this is a top you can dress up or down. Florida Salt Scrub – A few years ago when visiting Florida, I found this salt scrub in a restaurant restroom and immediately fell in love with it. Since then, every year when I visit, I purchase enough to last me the year and some extra for my family and friends who also love it. They have a variety of scents, but my favorite, of course, by far is the coconut scent. The company is based out of Florida and their products are all natural. The salt is finely milled, and the scents are beautiful. M Perfect Cover BB Cream SPF 42 PA+++ #21 Light Beige – I bought this a few months ago, but honestly forgot all about it until I was decluttering my make up drawer. I heard about this product from YouTube beauty influencer, Jessica Braun from JAMBeauty89. She talked about how much she loves it and that it also had a pretty good sunscreen in it. When I first tried it, I was a little taken back at how grey the color is. When I squeezed some out, I thought there is no way this color is going to work. I was happily surprised. I’m not sure what or how it does this, but it gives your face such a nice glow and the color and coverage is a good match for me. Mario Badescu Skin Care Facial Spray with Aloe, Cucumber and Green Tea – I have been seeing the facial sprays around and I never gave them a second look because I just thought they were kind of gimmicky. Apparently, I wasn’t the only one, so after watching Cate from Cate the Great, YouTube beauty influencer, say the same thing but changed her mind after using it, I thought I’d give it a try too. Okay, so even if it is gimmicky, I love it. I think it’s going to be even better once the warmer weather arrives and you want a nice refresher that will not ruin your makeup, this is a good one to reach for. It does claim to have some benefits such as hydrating, toning and it’s enriched with botanical ingredients, but I really enjoy it as a nice refreshing mist first thing in the morning. It does have other scents available, but I felt this would be the one I could use without it irritating me. 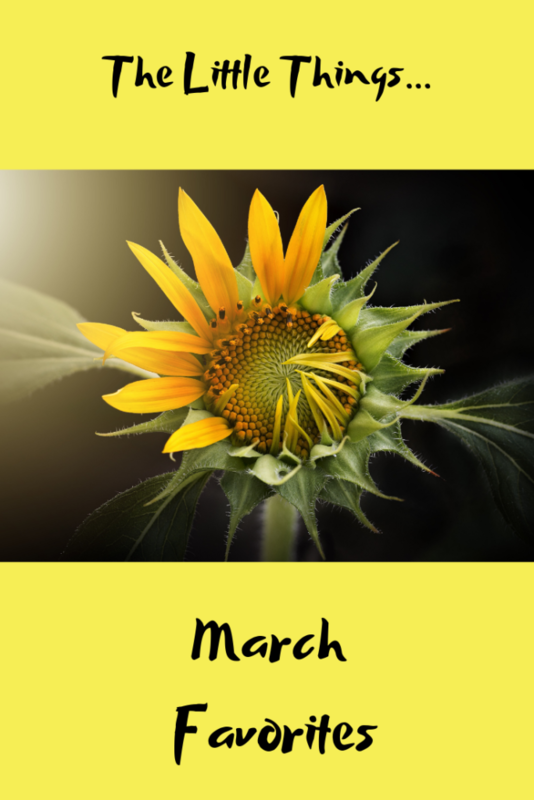 My last favorite of March I wanted to share with you is although I was not happy to lose our therapist this past month, I was happy that Michael was able to transition through the change successfully. If you missed my post about this, you can read all about it here. One of the hardest things for me is change. I try my best to go with changes as they happen and, in this case, I’m proud of myself for not getting so anxious that I wasn’t able to function. I’m even more proud of my son, as I was able to see how he has grown and the best lesson I have learned this month is that he is capable of more than I give him credit for. So, what has been your favorites this month? I’d love to hear all about them in the comments below. Hi Joann, I have to agree with you the Florida salt scrub is the best I love it. so clean & fresh. I would definitely recommend this to my friends.